Cory Logistics loads the 65te pilot boat for shipment to East Africa. Cory Brothers has just completed a pilot boat manoeuvre from Pembrokeshire to Kenya for commercial boat builder Mustang Marine. 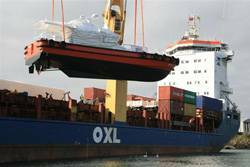 The boat was loaded directly from water onto a OXL heavylift vessel with 300te lifting capacity. Cory logistics project managed the full spectrum of services for the client including heavylift vessel agency, customs documentation, warranty surveying, insurance and managing technical issues. Mike Bryant of Cory Logistics said: "We were delighted to successfully complete this project which was part of our expanding operations in Wales. We have a strong commitment to the Welsh market since opening our Cory office in Cardiff earlier this year". Nahoda II, is a 22.4m pilot boat which will be used by the Kenyan Port Authority in the Port of Mombassa. Designed for operation in most weather conditions, Nahoda II has been built to operate for up to 3,000 hours per year at speeds over 20 knots. She is equipped to carry 12 persons made up of pilots and crew. Kevin Lewis, Managing Director of Mustang Marine commented: "This is the fourth pilot boat we have built for the export market - the other three are already operational in China - and we have used Cory Logistics every time because they provide a high quality and cost effective service".